“The Project” – David Peins’ first classroom robot. “How did you get started in robotics?” is a question that people often ask when they meet me and I am surrounded by my robots. This past weekend I was at Maker Faire in New York City and I met hundreds of children and their parents, hobbyists, tinkerers and curious adults who said that they have always wanted to build a ‘Robot,’ but did not know where to start. During the two day show, I presented some of the robots that I have built over the last fifteen years and some of my young students joined me to explain how they got started in robotics and to show the robots that they built with me in my PIC Robotics classes. I got started building robots because I had a problem that I believed robots could solve. I first became interested in robotics by reading science fiction stories that described very intelligent, highly functional robots. I wanted to build my own real autonomous robot that would follow me around and help me out, like the ones in the stories I was reading, but I did not know where to begin. I put off building robots for many years until I was presented with a context that seemed like the perfect application. I then started building mechanisms, electronic control circuits and finally embedded controllers and software to enable my robots to autonomously respond to changes in their environment. What was my context? I needed to find a way to teach electronics to high school kids who were not motivated and took my class because they were told that “Electronics will be fun!” Robotics is a rich context for teaching and learning many academic subjects but especially mechanical engineering, electronics, and computer science. Most of the kids that I taught were hyperactive, lacking in prerequisite science and math classes, had very limited academic skills and could not even read at grade level. They were looking for the easiest class to fill an elective requirement and many did not even know what electronics was and took the class because of suggestions of their guidance councilors or parents. I needed a carrot to dangle to get my students to begin to want to learn and to start asking the right questions. How did I do it? I started with model rockets because I had built them before and because the materials were available. The student’s first challenge was to build a tracking device as a payload for their rocket. I was looking for a project that all of my kids would be able to build so I had to modify this to, ‘any circuit that does something and is still functioning when the rocket is recovered.’ The problem was that, because of the weight of the primary cell batteries powering the circuits, the rocket motors required to safely launch the projects sent the rockets outside the ‘design window’ and onto neighbors’ roofs and into their pools. I discontinued the rocket projects and, after a series of projects that I thought were interesting, (a grip-strength tester, a reaction timer, a cricket, a laser tripwire and others,) I decided to build a robot. Robotics is a rich context for teaching and learning many academic subjects but especially mechanical engineering, electronics, and computer science. 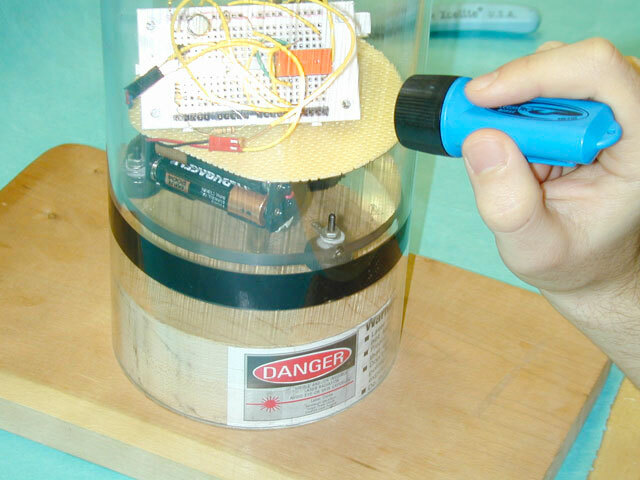 My first classroom robot was called “The Project.” It was a rotating platform inside a clear acrylic tube powered by a DC motor that could rotate in either direction. I mounted a laser pointer to the platform so that it projected light out of the cylinder in a circular pattern parallel to the ground. Students had to create a circuit that would cause the motor to rotate in such a way that the laser pointer was always aimed at the light. I told the class that a “Client who wished to remain anonymous,” had asked me, as the teacher of this “class of exceptional students,” to find a way to keep a “Non-Lethal” laser aimed at a “Really bright light.” I had just read Orson Scott-Card’s “Enders Game” and the premise, which I kept to myself, was that there were alien creatures that gave off a really bright light and we needed to invent a way to keep our defenses aimed at them with some robotic targeting system. To maintain a sense of urgency and realism, when students asked why they were doing this project, I would answer, “That is classified.” If I wasn’t sure if a particular method or component would meet the requirements for my academic goals for the class, I would answer, “I will have to ask the client,” which would give me time to think through the implications. I maintained a commitment to the premise and to this day, my students realize that there probably was no secret client, but they felt like they were part of some real project which, of course they were! So, I think that whether robots walk, roll, spin, emote, or whatever autonomously, and if they have a purpose and solve a problem, then they are real. I realized too, that all humans have a subconscious drive to create life, robots seem to be alive and on some level satisfy this need; especially in adolescents. To summarize, I got started in robotics because I had a problem to solve – I needed a context for teaching a complex subject to unmotivated students. I think that the most important thing that you can do to get started in robotics is to have a context; a really good reason for building a robot that will solve a problem and let the form of the robot be decided by the function. Many of the people that I meet think that robots are so cool and they want to ‘Do Robotics,’ but they really don’t have a specific reason in mind. Robotics contests all have a problem that contestants need to solve and the robot may take many different forms. I think that before you start to build a robot, you should have an application or a task for your robot and you have to ask yourself, “Will this robot be able to solve my problem?” Because robotics is a combination of mechanisms, electronics and computer logic, many people feel that they cannot be expert in everything so avoid robotics as a hobby. If you have some skills in one of the three but are lacking in others, there are plenty of mechanical kits, so that you don’t have to build a mechanism, many different ready-made electronic circuit boards for robotic control and even open-source code, pre-written to control robots. By starting with basic electronics, you will be able to connect more circuits to your project and successfully troubleshoot problems when things don’t work as they are supposed to. Wherever you decide to start working with robotics, there are plenty of resources and people who are willing to help when you do run into a problem, including me! I look forward to hearing from you.